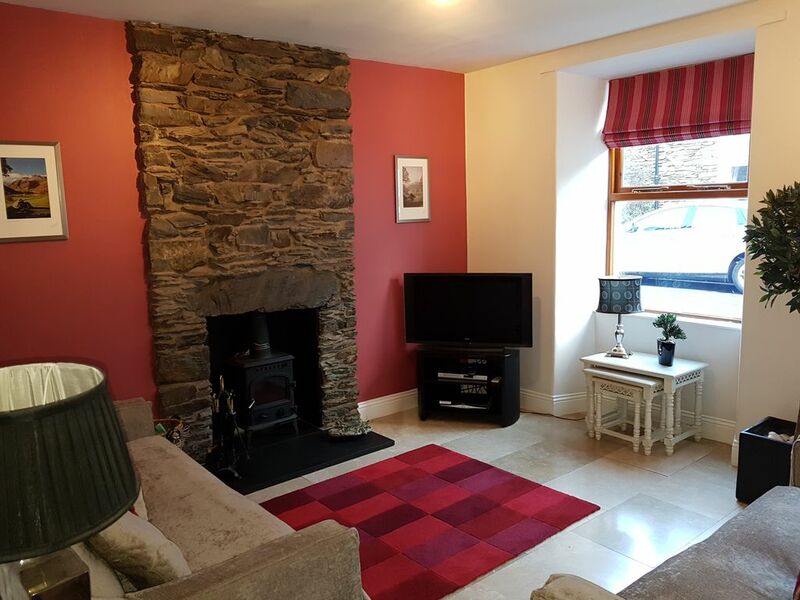 Delightful period stone cottage conveniently located in the heart of Bowness on Windermere close to all amenities including restaurants, pubs, shops and cinema. Only 5 minutes walk to the edge of lake Windermere and marina. Ruskin Cottage has a cosy sitting room with stone fireplace and traditional wood burner. The spacious dining room has a romantic feel with charming window seat. The kitchen is fully equipped with fridge, freezer, microwave, washing machine and dishwasher. Outside there is a small south facing courtyard with small garden table and chairs. The cottage has two double bedrooms, master bedroom with king size bed and en suite shower. Second bedroom has a double bed. Permit provided for free on street parking. Living room sits 4 people, has stone fireplace with wood burner, television, DVD player and satellite TV. We were very lucky, as when we arrived, the builders who had been working next door, pulled down their scaffolding and went away! The cottage is in a perfect location for walking down the hill to Bowness, or up the hill to Windermere. There are great cafes and restaurants a very short walk away. The on-street parking with a permit works really well. The cottage is very comfortable, with lovely decor and great quality beds and bedding. It is very well equipped and the roomy laundry room was much appreciated. We think it should be made clear that although there is an ensuite to the main bedroom, it has only a shower and handbasin, no loo. Had a wonderful stay, our second at Ruskin Cottage. Lovely and cosy and everything we could want for a comfortable stay, home from home. Thank you. Until the next! A lovely property which is very convenient for Bowness and the ferries. We had a very enjoyable stay at the cottage - it was comfortable and clean and very well-equipped, and we had everything we needed. The cottage is very convenient for getting into town and for the ferries and buses.
" perfect place to be "
Lovely cottage, very nicely done inside with quality linen, comfy beds and well equipped kitchen, perfect location for everything. The cottage is really lovely, well equipped and very clean, and is in a great location to explore. I stayed with my friend so there were just 2 of us in the cottage making it very comfortable, the space is very generous. I would stay in the same cottage again. we had the added good fortune of lovely weather, but unfortunately that cant be ordered!